The Salesforce1 application is very easy to navigate and was designed in a way that is similar to many other apps you probably use. Let’s look at a few navigation tips and tools to get you well on your way to using the app like a pro. The Salesforce1 Navigation menu is where you should begin. You can toggle the navigation menu by selecting the menu icon on the top left of the app. 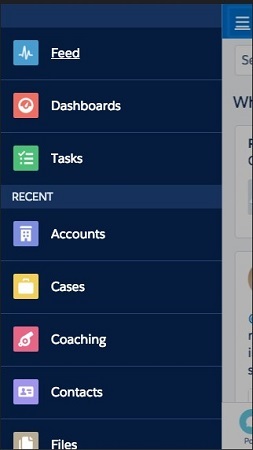 Using the Salesforce1 Navigation menu. The Navigation menu is customizable, so if the default configuration doesn’t meet your organization’s needs, you can change the items that appear and the order in which they do. You can select the items that will always appear at the top of the menu, such as tasks or dashboards. This is called the selected list. The first item you choose for the Selected list will be the landing page for the app. In other words, that’s what users will first see when they log in. Keep user adoption in mind when setting up your Navigation menu. Put the items that users will use most often at the top of the list, because the Navigation menu is not user-specific and the entire organization will see the same Selected list. Under the Selected list, you see a Recent list, which shows you the most recent objects you’ve accessed, either on the browser or mobile version of Salesforce. Finally, the last section is the Apps menu. Anything that is represented as a tab in Salesforce can be visible to a user in the Navigation menu. Users can only see the tabs and items in the Navigation menu that they have permission to access via their Salesforce profiles. Choose Setup →Mobile Administration →Salesforce Navigation. The Chatter Settings page appears. Use the Add and Remove arrows to move the items you want into or out of the Selected column. Use the Up and Down arrows to rearrange the order of the items in the list. The item named Smart Search Items becomes your Recent list and expands into multiple items that you’ve recently accessed. Anything above the Smart Search Items element becomes part of the Selected list in the menu, and anything below it falls under the Apps list in the menu. When you’re done, click Save to save your work. Your navigation setup is complete! Now you can log in via your mobile device to see the changes you’ve made. There is a great tool that you can download via the Google Chrome Web Store, called Salesforce1 Simulator. It displays a large mobile interface on your desktop where you can toggle and preview the changes and customizations you’ve made to Salesforce1.